If your event is being held over multiple days, you can add an End Date on your Save the Date or Invitation. From the Design & Details page of your invitation, simply click Add end date button by the Event Date field. At this time it is not possible to have guests RSVP for separate events or separate days; they can only RSVP for the event as a whole. 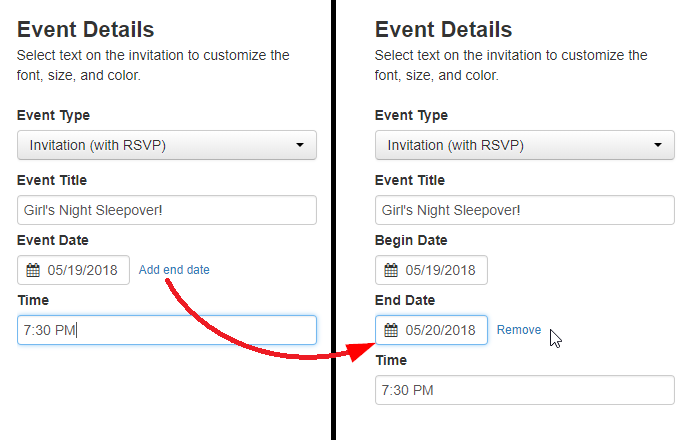 If you need separate RSVPs for separate events or days, just create a separate invitation for each event. Another option would be to create a poll asking your guests which date they can attend. For more information about setting up a poll, click here. The "Add end date" option is currently not available in the Punchbowl mobile app.